Act! Premium Cloud gives you instant online access to the #1 best-selling Customer & Contact Manager in a modern, secure Cloud environment—no IT needed, no hardware required, just an affordable subscription. Because we take care of the initial setup and ongoing software management, you can jump right into rich contact, calendar, opportunity, and emarketing details from your computer, tablet, and mobile device. Upgrades, new features, and compatibility updates are delivered to you automatically. Nightly backups and recovery protect your data from loss or damage. Your subscription includes complimentary access to digital self-help resources and expert technical support advisors. 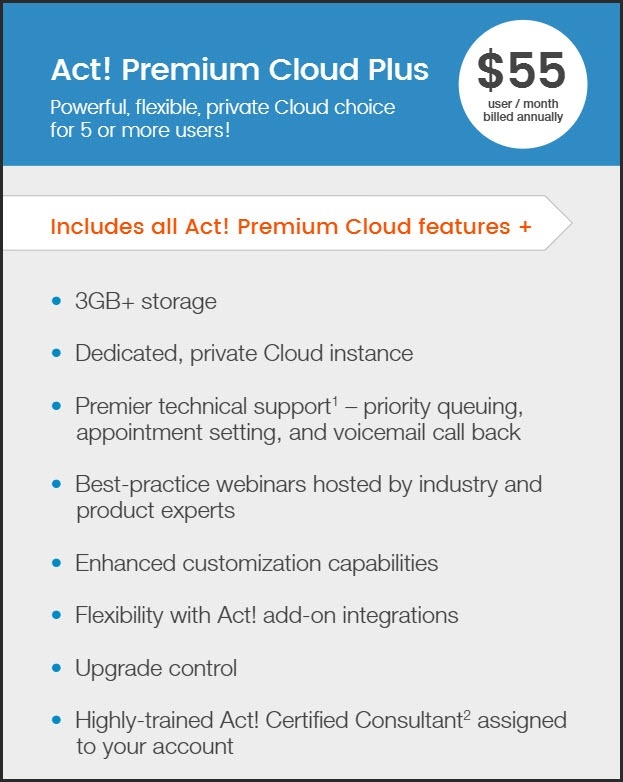 If your business requires a powerful, flexible, private Cloud environment and you have 5 or more users, choose Act! 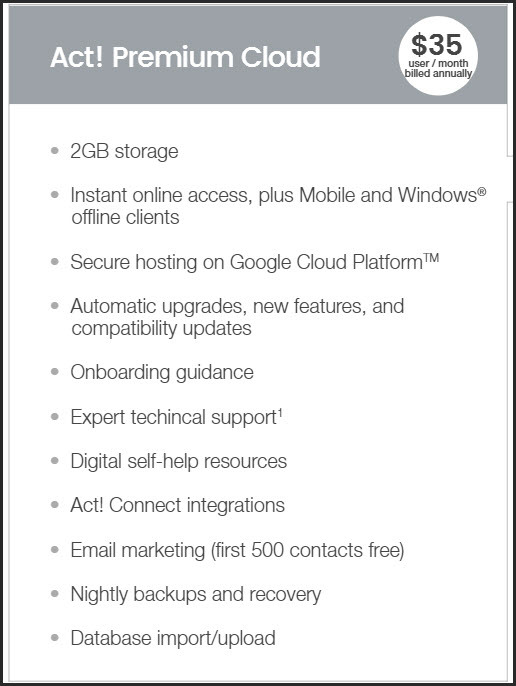 Premium Cloud Plus. Not only do you gain greater data storage, a private Cloud enables you to tailor your own unique environment—enhanced customizations, flexible integration with Act! add-ons, and upgrade control.Experience VIP treatment with Premier technical support, best-practice webinars hosted by industry and product experts, and a highly-trained Act! Certified Consultant assigned to partner with you from the beginning. A subscription to ACT! Premium Cloud means you and the members of your team can login to ACT! Premium from virtually anywhere, so you can view and update contact and calendar details on-demand. Whether you’re working from the road, your main office, or remote locations, you and your team have access to the same important relationship details—contact information, calendars and activities, opportunities, groups and companies—so you’re always on the same page, even if you’re not in the same location. To learn more about ACT! Premium, visit here.Need offline access too? No problem. An offline client / Windows® option is available for mobile users who require access to contact and calendar details when a connection to the web is unavailable. Because we take care of the technical nuts and bolts, you can forget about additional hardware needs or complex configuration. You also benefit from our secure, state-of-the-art data center that’s monitored 24/7, and we handle the ongoing maintenance and perform nightly back-ups, so you can rest-assured your valuable relationships details are in good hands. If you happen to need technical support along the way, it’s included with your subscription. Minimal start-up costs are required to go live, because we’ve included what you need to get started successfully in the cost of your subscription. 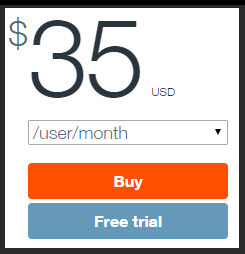 Our subscription billing also allows you to pay-as-you-go so you can begin managing your contacts and calendar for less than $2 per user, per day. details so you can keep your focus on your business. With Act! Premium Cloud, you get concierge service from onboarding experts that help you get setup, log in, and start right away. Automatically receive upgrades, new features, and compatibility updates with no action by you. Should you have questions, learn more about Act! Premium Cloud with digital self-help resources or work with expert technical support advisors for answers. Choose Act! Premium Cloud Plus for a VIP experience, including Premier technical support with priority queuing, appointment setting, and voicemail call back. Attend live best-practice webinars hosted by industry and product experts. For specialized guidance, work with a highly trained Act! Certified Consultant assigned to partner with you from the beginning. To learn more or have questions, schedule a call with Julie. Why choose ACT! Cloud Hosted? Hosted by ACT, no IT required!